Bardejov is dominated by the monumental Church of St. Aegidius, mentioned for the first time in 1247. A three nave basilica with multiple chapels was completed in 1464. It hosts eleven precious Gothic winged altars with panel paintings. The central square, which used to be the town’s medieval marketplace, is surrounded by well-preserved Gothic and Renaissance burghers’ houses as well as the Basilica of St.Giles. 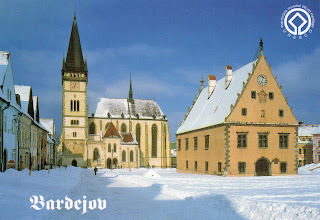 One of the most interesting buildings is the town hall, built in 1505. The lower part was built in the Gothic style, while the upper part was finished in the Renaissance style. This was the headquarters of the city council and also the center of the town's economic, social, and cultural life. In 1903, the town hall was adapted to serve as Saris Župa Museum, the oldest museum in Slovakia.